What It’s About: Thief Phillipe Gaston (Matthew Broderick) escapes from the dungeons of the Bishop of Aquila (John Wood). He is saved from the Bishop’s men by Captain Etienne Navarre (Rutger Hauer), who is also on the run from the Bishop. Navarre is the victim of the a strange curse involving his lover Isabeau d’Anjou (Michelle Pfeiffer). Can Gaston help Navarre learn the secret of the curse and defeat the Bishop? Why Watch it Today? : Rutger Hauer was born today in 1944. Hauer never achieved full-fledged stardom in the United States, but appeared as a lead and in supporting roles in many cult favorites. Ladyhawke sees Hauer in one of his rare American roles as a romantic figure, though the twists of the plots mean he, appropriately, spends most of the running time as a gruff knight with a secret. 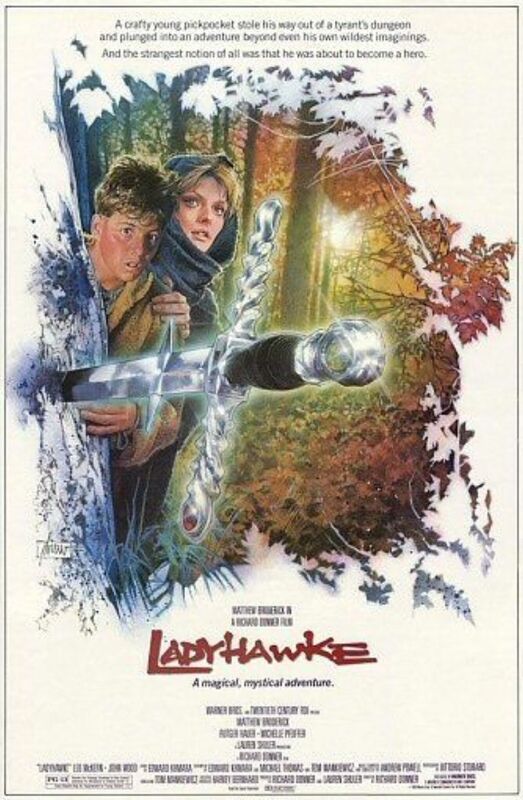 Ladyhawke is a fun, if light, fantasy film, with a good sense of humor, amusing characters and beautiful scenery. Other Choices: Rutger Hauer has a memorable role in previous Movie of the Day Blade Runner. This entry was posted in Adventure, Buddy Flick, Comedy, Event Film, Fantasy, Movie of the Day, Mystery, Romance, Sword and Sorcery and tagged Alfred Molina, Best Sound Effects Editing Nominee, Best Sound Nominee, bishop, black magic, castle, curse, John Wood, knights, Leo McKern, magic, Matthew Broderick, Michelle Pfeiffer, monks, Richard Donner, Rutger Hauer, thief, transformations.